"But war starts at midnight!! " Poor Colonel Blimp.... he just doesn't understand. Times have changed Blimp old-boy; your adversary will no longer play by the rules. A piece of paper on "conducts of war" will not hold back an army of embittered patriots striving to regain the esteem ( and fear ) of the world for their crippled nation. Hitler wants Lebensraum for his Bundes-Republik, whether a little nation like Britain approves or not. And outdated theories on how war should be fought are not going to protect jolly ol' England.
" Clive, if you let yourself be defeated by them just because you are too fair to hit back the same way they hit you, there won't be any methods but Nazi methods. If you preach the rules of the game, while they use every foul and filthy trick against you, they'll laugh at you. " explains Herr Kretchmar-Schuldorff, " This is not a gentlemen's war. This time you are fighting for your very existance, against the most devilish idea ever created by a human brain. Nazism. " Major-General Clive Wynne-Candy is the title character in this fictional war biography from two of the most creative masterminds in film history : Emeric Pressburger and Michael Powell ( Black Narcissus, I Know Where I'm Going! ). Colonel Blimp was originally a cartoon by David Low, featuring incidents about a bald-headed, red faced buffoon of a colonel and his old-fashioned political notions. 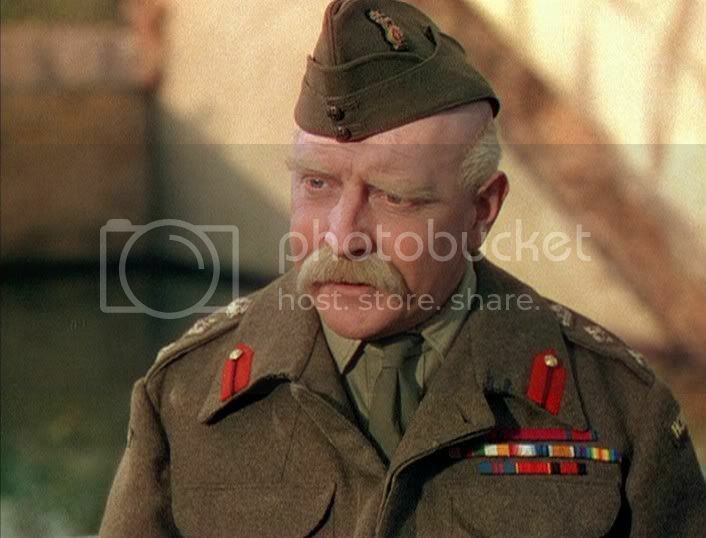 It was decided that this popular comic would be a very good main character for a film, and so Emeric Pressburger weaved a wonderful story around this pompous walrus and out came the script, " The Life and Death of Colonel Blimp". The story begins in the current year, 1942. A group of army soldiers are preparing for a routine war simulation exercise. 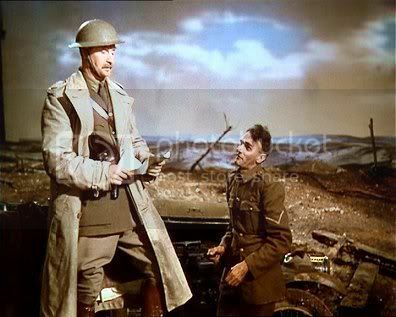 Colonel Blimp ( Roger Livesay ) is in charge of the 'Defense of London', and must have his men ready for "WAR BEGINS AT MIDNIGHT". Now, the opposing "army" discuss amoung themselves.. "The Nazis will not wait for war to be officially declared so why should we? Let's strike early!" And strike they do, promptly plopping Blimp in his bath, which happens to be a pool of retrospection for the benefit of us viewers. We follow Wynne-Candy from his youthful days as a decorated British officer in the Boer War, to his middle aged years of hunting wild animals, to being a Brigidier in France during WWI, to the present times as a Major-General for the Home Guard - a retrobutive position he took to prove his worth, after the Army declined him a position in the military. Ah! 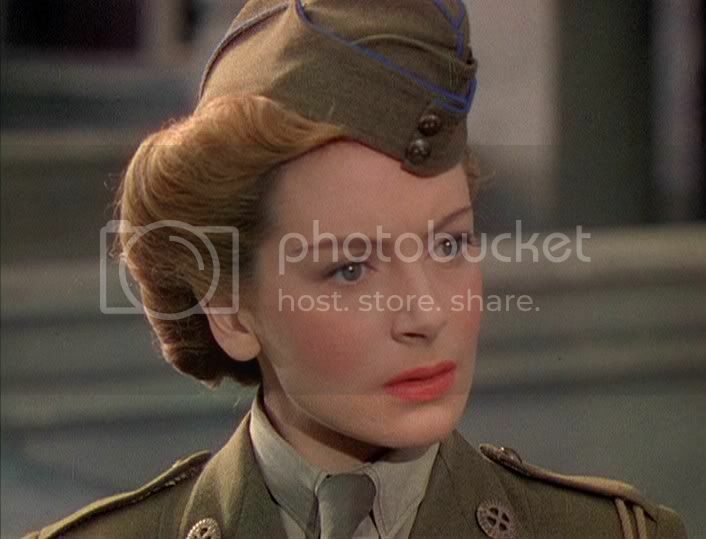 But lets not forget the romantic interest in this movie - Deborah Kerr. She plays three different roles in three different eras, each one representing the ideal image of English womanhood. Clive meets the first portrayal from Ms.Kerr ( as Edith Hunter ), when she notifies him of the anti-British propeganda a scoudral named Kaunitz is spreading in Berlin. Later, at a restaurant there, they intentially antagonize him and Clive must attend a 6am duel to defend his honor. 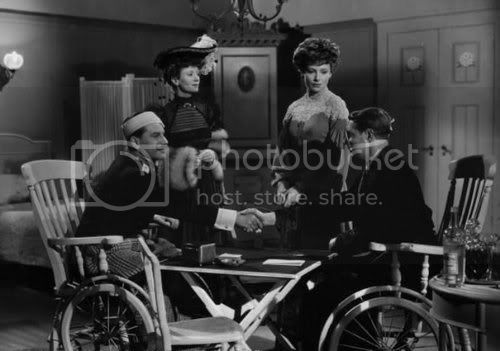 His opponent, Theo Kretchmar-Schuldorff ( Anton Walbrook ), is a master swordsman and the outcome of this stunt is a draw. While they are both recouperrating in a nursing home for two months they become good friends, even though Schulldorf can only say "very much" and not very much beyond that. Miss Hunter is also a frequent visitor, because the British government thought it be better for international relations, to make her the cause of the duel. It is not until Schulldorf announces his engagement to Miss Hunter, that Clive realizes he was in love with her too, and throughout his life he tries to find another like her. Which he does - or so he thought. 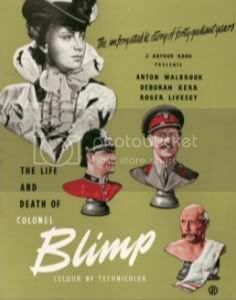 Production on "The Life and Death of Colonel Blimp" began in late 1942. After four months of filming under "blitz" conditions, an expense of 1,000,000 pounds, and having beared a watchful eye from the government ( Prime Minister Winston Churchill tried to prevent the movie from even being made ), it was released in 1943 and recieved praiseworthy reviews from the critics. 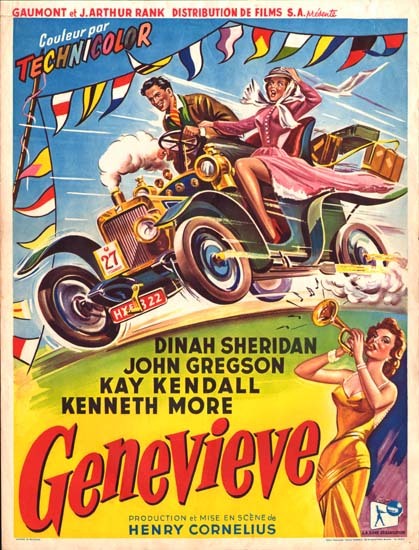 Much of its original 163 minutes of footage was cut to 93 minutes for its overseas distribution because of its disheartening image of British military prowress ( Daily Mail wrote, " We cannot afford to put out a burlesque figure like this screen version of Colonal Blimp, to go round the world as a personification of the regular British officer " ), and its sympathetic German character. Luckily, today it can be viewed in its entirety on the beautiful two-disc Criterion Collection edition loaded with supplementary material ( what a great company Criterion is! ). You can marvel at the sensous Technicolor and the crystal-clear detail of this transfer. Jack Cardiff, a long time collaborater with Pressburger and Powell, did a magnificent job on the cinematography, so fortunately none of that footage was lost, as is the case with some other films. Cable television does not air this movie often, so its no surprise that it is relatively unknown in the United States. 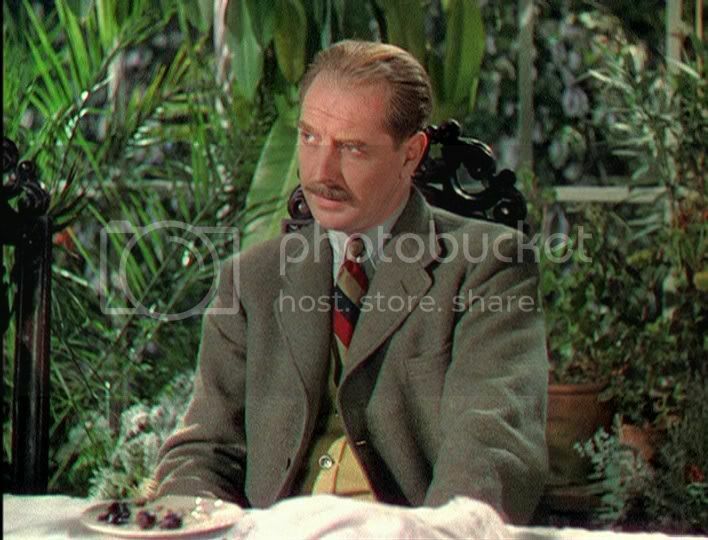 Nevertheless, "The Life and Death of Colonel Blimp" is a magnificent film and deserves all the recognition it can get. I like this movie "very much".